Well, I accidentally let mine freeze this winter (oopsie!) and had to redo it, so here’s a half how-to. Assorted succulents – I used 1 Ripple Jade (Crassula arborescens undulatifolia) for the top tier (broken into three parts), 4 (4 oz) Echeveria “Dondo”, 2 Key Lime Pie (adromischus cristatus) and 2 Graptosedum “California Sunset” (Graptosdeum)… but you can really use anything that’s small and will fit in the container you’re using. 1. 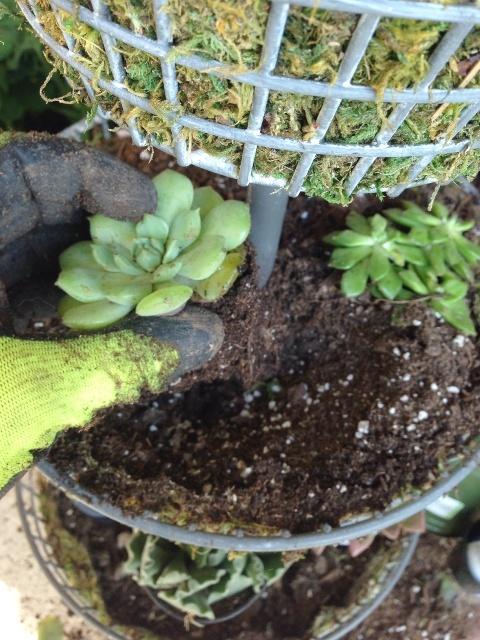 Use the scissors to cut strips of the sheet moss, slightly wider than the width of each tier of the wired container, and place them inside each tier, moss-side-facing-out, starting the strip at the top edge of the wire basket (the “extra” width of the strip should curve around the bottom of the basket slightly, towards the inside of the tower). The moss is mostly for looks, but it also keeps the soil contained, so you just need to make sure the edges are covered so soil doesn’t fall through the wire. 2. Cut (or tear) newspaper to fit in the bottom of each tier and lay it flat all the way around. Again, this is just to keep the soil from falling out and still allow for water to drain. 3. Create a thin layer of gravel at the bottom of each tier to help weigh it down (and provide better drainage), then sprinkle the sand evenly over the gravel for each tier. 4. 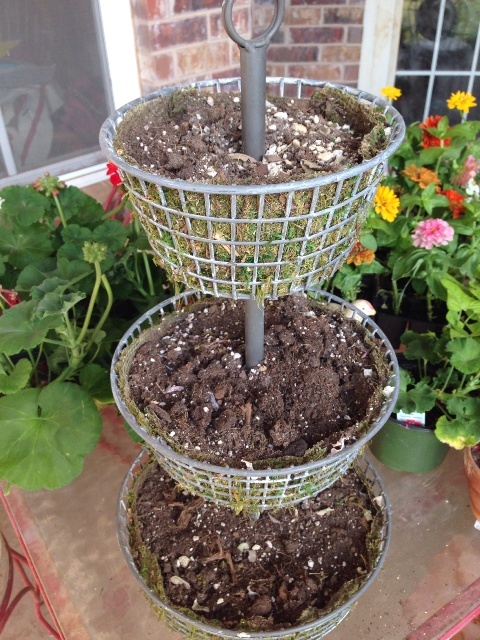 Continue to fill each tier with the cactus potting mix, careful not to fill above the edge of the container. 5. 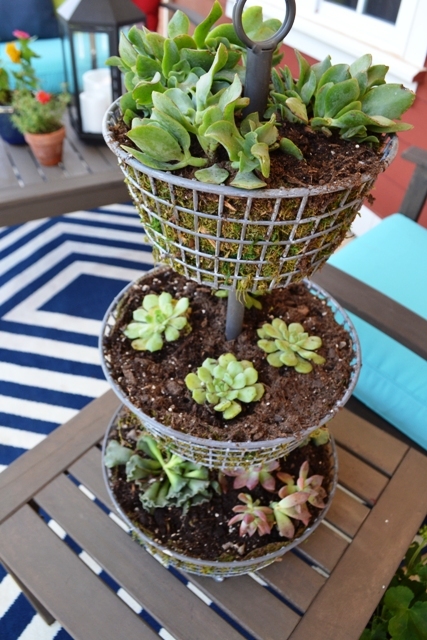 Determine the placement of the succulents by placing them (in their plastic container) where you think they look best. You can mix up the types and placement, but I wanted a more uniform look for this project, so I kept them evenly spaced (3 parts around the top, 4 of the same around the middle, and 2 of each kind, alternating, along the bottom tier). 6. 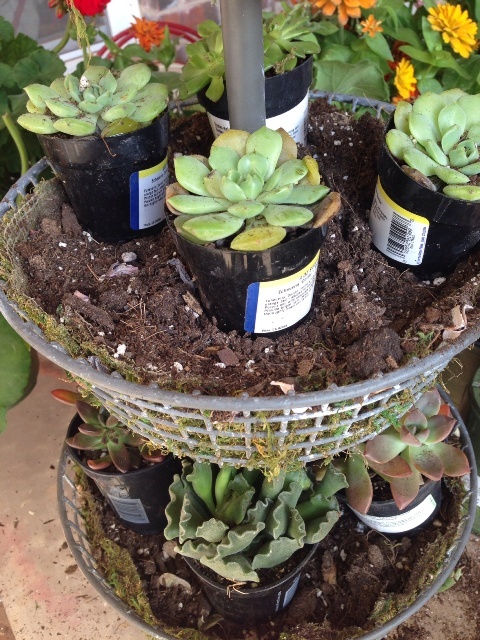 Working one at a time, dig a small well for each succulent and then gently place it, reinforcing with soil to keep it in its spot. I always feel like potting succulents is weird because they’re so light (no moisture in the soil) that it doesn’t have that satisfying “plop” into the potting mix that flowering plant does. Just mound up soil round it once it’s placed, but be aware it still may feel fragile. Once all of the succulents are in place, they may be a little dirty, but don’t worry. Once you give the entire tower a gentle watering, they’ll be bright and beautiful!